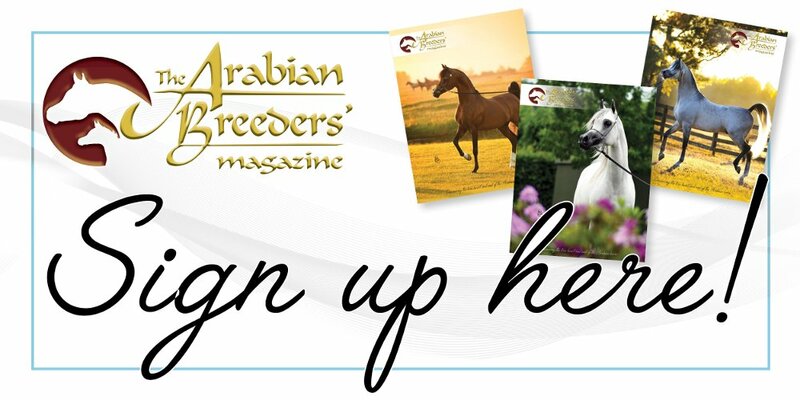 First published in The Arabian Breeders’ Magazine Volume I Issue I September 2016. Celebrating the Champions – AV Cloud Dancer. “I had long awaited a foal by WH Justice (WH Justice x Vona Sher-Renea by El Sher-Mann out of my mare, Oml Belusena Dream (Dreamcatcher SMF x Om El Benedict by Sanadik El Shaklan). 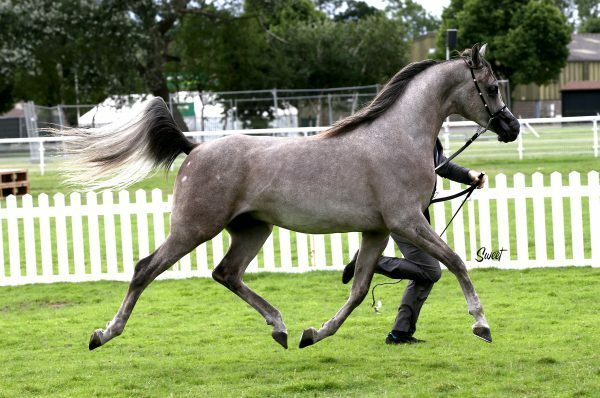 In fact, I was so excited about this cross that I actually wanted it to be a colt, such was my belief that this could be an outstanding Arabian with a pedigree to match. “On 3 May 2014, a colt was born. Most importantly, he and his dam were healthy. And indeed he was outstanding. Outstandingly ugly. A shoe box had more shape and nuance than his head, and a worm had larger eyes! And to top it all, by two fabulous grey parents, he made out he was chestnut. “Magically, over the next ten days, bone structure and eye banking began to appear and, thankfully, eyes too. The nose, once straighter than a Roman road, actually developed a bend. And joy! Two white hairs sprouted on his top eyelids. The boy was going grey. All was well with Hero’s world. AV Cloud Dancer. Credit Sweet Photography. “Hero – show name, AV Cloud Dancer – is a sensitive, intelligent soul, so I was full of trepidation when I took him to his first show in 2015. But he obviously had an inner strength, took the whole thing in his stride, and floated around the arena to take the class and the Junior Male Championship, thereby qualifying for Paris at his first outing. I was over the moon. “The next stop was the 2015 British National Championships, where I showed Hero myself once more. He was pulled in fifth after the first go around, and to my complete amazement, he was then pulled in first and class winner under judge Marek Trela! Before I went to pour some celebratory bubbles, I rang my father to tell him he had been right all along about the ugly duckling he had named ‘Hero’. I am sure that I heard his voice crack as he told mum. “As much as I love to show my own horses, Hero’s stride is so long and light – he floats above the ground and is deceptively fast. Wanting his movement to be fully appreciated, I arranged for one of the fastest out there to show him at this year’s British Nationals, Rod Jones. Having spent a month at Rod’s yard, Hero went into the ring with him at Malvern and judge Sylvia Eberhardt pulled him straight into first place and there he stayed, much to my delight. Come the championship, my little immature baby from the year before, now a very tall, elegant young colt, was chosen as British National Champion. 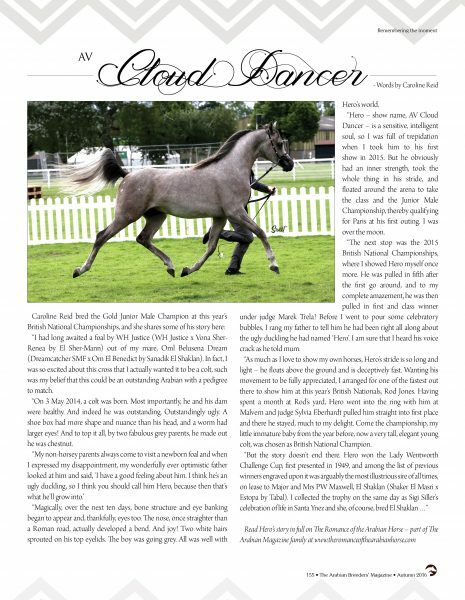 Read Hero’s story in full on The Romance of the Arabian Horse – part of The Arabian Magazine family.